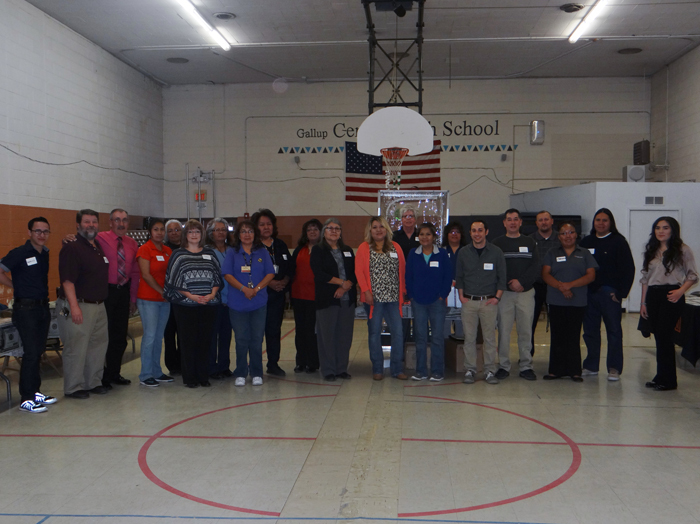 In April, First Nations worked with Gallup Central High School financial literacy teacher Arnold Blum and First Financial Credit Union’s Dale Dedrick to provide the $pending Frenzy financial simulation. The goal was to help GRADS students (Graduation, Reality and Dual-Role Skills program) and other Gallup Central students put principles they learned throughout the year into practice. First Nations provided a series of four simulations for all students at Gallup Central (about 100). The $pending Frenzy simulation allowed students to practice handling a one-year salary of $30,000 to make spending decisions at a series of booths for big purchases like a car and a home (or rental). In addition, students considered smaller purchases such as a food plan and home furnishings. Students also had the opportunity to save money and/or invest money at a bank booth, were instructed to pay taxes on their salary at a tax booth, and were dealt “chance” cards with unexpected life events that either cost them or resulted in money (such as the birth of a child, breaking a leg in an accident, or receiving an award for a piece of art). Thanks to the coordination of Blum and Dedrick, the various booths were run by local merchants who represented the purchases students had to make. For example, Realtor Jason Valentine from Coldwell Banker ran the home-buying booth, Teri Garcia from Amigo Chevrolet operated the automobile sales booth, Castle Furniture owner Jimmy Villanueva sold items at the shopping mall booth, and representatives from the local First Financial Credit Union managed the bank booth. Additionally, several local officers of the Bureau of Indian Affairs’ Office of the Special Trustee for American Indians, and representatives from Native Community Finance (a local Native Community Development Financial Institution), Lowe’s Shop’n Save, and Little Singer Community School assisted with a variety of other booths. This initiative was made possible through generous funding from the W.K. Kellogg Foundation. For more information about the program please contact Benjamin Marks, First Nations Senior Research Officer, at bmarks@firstnations.org or (540) 371-5615.